There are two main types of porphyrias. One affects the skin and the other affects the nervous system. People with the skin type develop blisters, itching, and swelling of their skin when it is exposed to sunlight. The nervous system type is called acute porphyria. Symptoms include pain in the chest, abdomen, limbs, or back; muscle numbness, tingling, paralysis, or cramping; vomiting; constipation; and personality changes or mental disorders. These symptoms come and go. Certain triggers can cause an attack, including some medicines, smoking, drinking alcohol, infections, stress, and sun exposure. Attacks develop over hours or days. They can last for days or weeks. Porphyria can be hard to diagnose. It requires blood, urine, and stool tests. Each type of porphyria is treated differently. 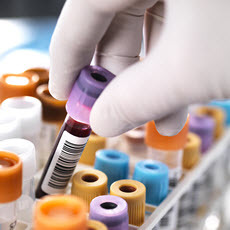 Treatment may involve avoiding triggers, receiving heme through a vein, taking medicines to relieve symptoms, or having blood drawn to reduce iron in the body. People who have severe attacks may need to be hospitalized. Article: CRISPR-Cas9 genome editing induces megabase-scale chromosomal truncations. Article: Porphyria: A Rare, Complicated, and Misdiagnosed Disease.